UPDATED: Tue., Dec. 19, 2017, 8:37 p.m. Check out more information on squirrels at the WDFW’s Living with Wildlife website: http://wdfw.wa.gov/living/tree_squirrels.html. 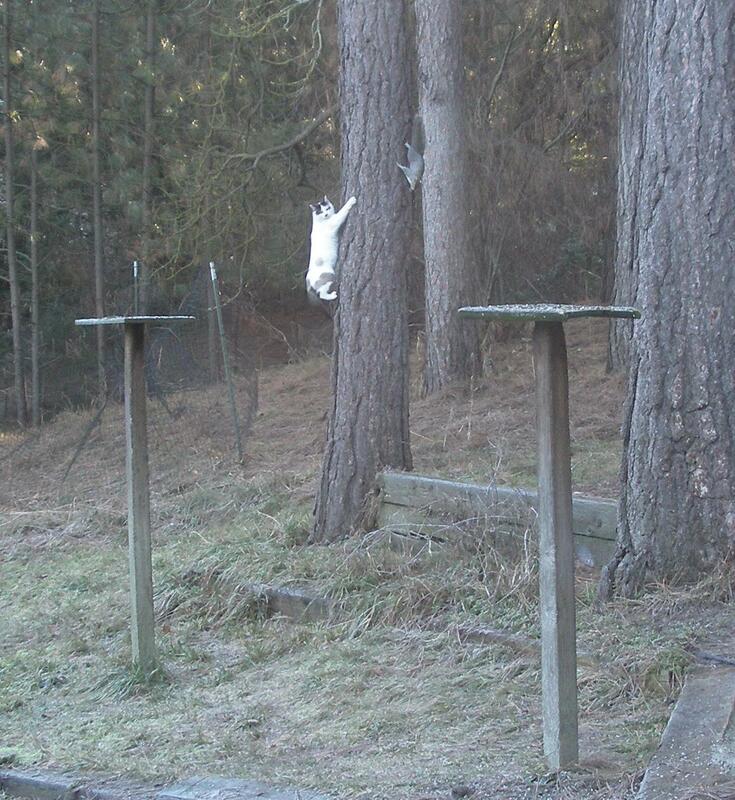 Squirrels are the clowns of the garden. They are a never-ending source of entertainment as they scamper up trees, run along thin wires and pull off Houdini-like stunts to get to birdfeeders. They are also terrorists with tails. They dig up freshly planted tulip bulbs, raid bird feeders, dig up container plantings and invade bird nests, sheds and attics. The most common squirrel we see in urban areas here is the eastern gray squirrel. It was brought from its native range on the East Coast by folks who thought it would be cute to have them running through the trees in the Northwest. The Washington Department of Fish and Wildlife does not consider them part of the state’s native wildlife like the Douglas, red, western gray or flying squirrels. Some people say that the gray squirrels drive out the native squirrels but the WDFW says that our native squirrels are found in rural conifer forests and utilize completely different types of habitat and food sources. Gray squirrels stay close to deciduous forests found in cities that mimic their native eastern habitat. Gray squirrels are opportunists that feed mostly on seeds, nuts, acorns, tree buds, berries, leaves, and twigs with a side order of the occasional fungi, insect, bird egg and nestling. Unfortunately, they don’t differentiate between our favorite garden plants and other sources of food, it all tastes the same to them. Squirrels generally cache their winter stores in hollow logs, tree cavities or in the ground near their nest sites. Nest sites can be tree hollows, old owl nests or twig structures they build 15 feet to 50 feet up a large tree. A gray squirrel and its kits maintain a territory of about a half-acre where food sources are good. They can have up to two litters of kits each year with the kits being dependent on mom for three months before they are able to survive on their own. So how do you peaceably share your space with these cute but bedeviling and intelligent critters? Don’t feed them: Squirrels are drawn to food sources like bird feeders and other sources of seeds and nuts. Set bird feeders at least 10 feet from tree trunks and install a conical squirrel baffle either below the feeder if it is on a pole or above the feeder if it is hanging from something. These are available at bird feed supply centers. Clean up spilled bird seed and fallen nuts regularly. Cover new planting of bulbs with a layer of chicken wire to prevent digging. Anchor the wire well and cover with mulch to hide the wire. If they are getting into container plantings, try covering the containers with a fine mesh wire right after you plant them. According to the Washington Department of Fish and Wildlife, live trapping eastern gray squirrels is allowed but live trapping native squirrels is not. If you find they have moved into a shed or an attic it’s better to call a professional wildlife catcher than trying to get them out yourself. Pat Munts has gardened in the Spokane Valley for over 35 years. She is co-author of “Northwest Gardener’s Handbook” with Susan Mulvihill. She can be reached at pat@ inlandnwgardening.com. This story has been changed to say that live trapping native squirrels is not allowed by the Washington Department of Fish and Wildlife. Published: Dec. 13, 2017, midnight Updated: Dec. 19, 2017, 8:37 p.m.